Don’t be that person buying plastic bags in store; just bring your own! Leave your shopper bags in your car at all time and even if you forget to bring them into the shop, load your groceries back into the trolley and then pack them into the bags in the boot. and get an eco-friendly bamboo one! Do you really need a toothbrush that outlives you for hundreds of years? 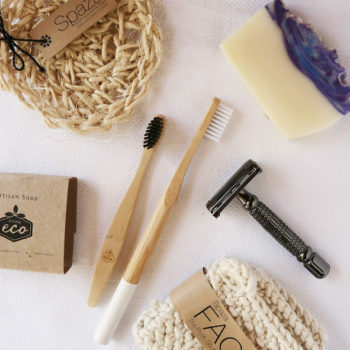 Bamboo brushes are a super easy swap. 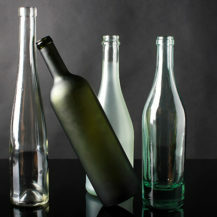 Get your hands on either a lifetime glass bottle or even a sleek stainless steel water bottle. Plan ahead and refill your bottles as you go. This takes a bit of reminding yourself every time you’re out and about, causing you to think “I’ll just grab a bottle” – but even though it says recycled plastic, it is still being put into the environment and are often not recycled at all or to the extent we hope. Remember, one million plastic bottles are bought every minute around the world, so now is your chance to stop this! 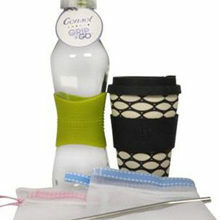 If you rely on tea or coffee to get you through your day, make sure you enjoy it in a reusable cup. A lot of takeaway cups are only partially recyclable, so choose to be part of the solution and not the problem. 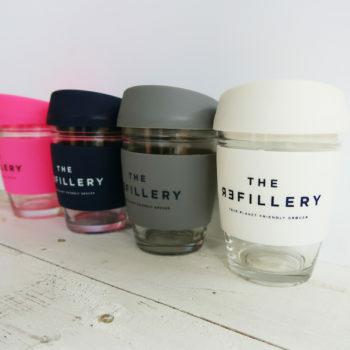 The Refillery stocks reusable cups in gorgeous colours, so match the colour to your mood and enjoy your morning cuppa on-the-go in style. 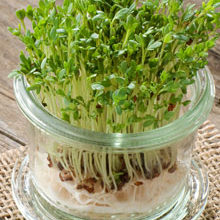 Take a look in your fridge, pantry and bathrooms and see what you can reuse. Glass jars last forever and when filled with pasta and cereals can make your pantry look stylish and organised. Bring your jars with you when you visit a store like The Refillery and refill them with all your day-to-day household needs from kidney beans, chia seeds and turmeric powder to dishwashing liquid, shampoo and body cream. It’s something we do willingly about our new favourite hangout, shoes or favourite pic with mates, but word-of-mouth about ditching the plastic will help grow the movement exponentially. It starts with one swap out from a single-use plastic to a reusable option and the rest is a snowball effect that actually has a positive impact on the world we live in and wish to pass on to our kids and their kids. Have you ever considered how much plastic wrap you use and simply throw away? Have you realised that the plastic wrap will never degrade, can’t be recycled and will basically be here forever? It’s enough to throw you off a little. Beeswax wraps are a fabulous replacement for plastic wrap, they have antibacterial functions and keep your food fresh for just as long. What’s better is you simply wash the wraps and reuse them. Once they are at the end of their lifespan – six months to a year, if not longer – you just throw them into your compost pile and they will degrade naturally. If you’re feeling inspired, put your inner DIY queen to the test and try to make your own wraps at home using beeswax pellets (available online and in-store) and fabric of your choice. 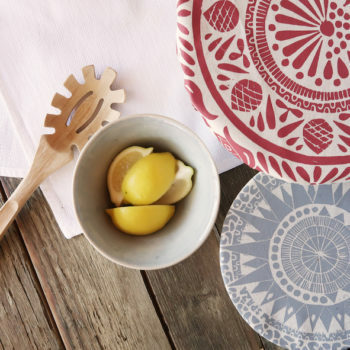 Another amazing alternative is the beautiful range of bowl covers from Spaza Store – a local company that empowers stay-at-home moms and women in townships to make a living. They are not only ethical but truly exquisite and a huge conversation-starter when you have guests admiring your food covered safely a bowl cover. This may be new to Joburg, but it’s taking shopping back to its old-school roots where you can pack your own containers and bring them in to refill with your products. Alternatively, use recycled brown paper bags or buy a jar in store. It’s really fun and simple, and you’ll be hooked from your first visit. Recycling is easy when you know what’s going on and how it works. 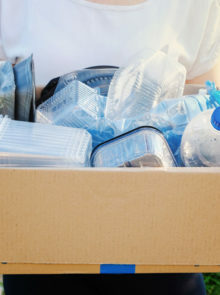 Knowing what can be recycled in your area is key to getting started, and if there isn’t a kerbside collection system in your suburb, then what next? 1 Organised kerbside collection service This is a fantastic option if it’s available in your residential area. You place all recyclable items into a bag and it gets collected and sorted for you. See pikitup.co.za for more information. If you’re suburb isn’t already part of the system, get your local homeowners’ association involved to try get collections in your area. 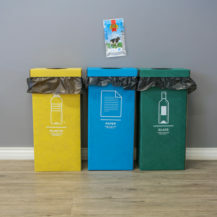 2 Take your recyclables to a municipal drop-off point If you’re not sure what services are available in your area or city, just Google them – you’ll be surprised how many options there are. From Pikitup garden centre dropoffs to checking out mpactrecycling.co.za to find out the details for a kerbside collection as well. 3 Let informal recyclers take your recyclable items out of your rubbish They then take it to a buy-back centre, which helps them make a living, plus ensures items get recycled. Recycling isn’t enough to combat the oceans of plastic (literally!) we already have on earth, so make sure you’re aware of what you’re consuming as an individual or family, and how you could decrease your waste on the whole. Try to remember the five Rs: Refuse, Reduce, Reuse, Recycle and Rot. If we all play a part in doing as many of the five Rs as we can, we will all make a huge difference – one that our children and grandchildren will thank us for later!